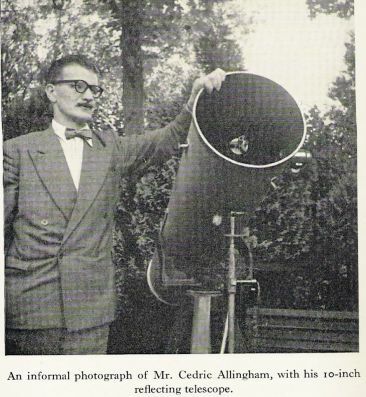 The following biography of Cedric Alligham is taken from the back cover of Flying Saucer From Mars, published by Frederick Muller Ltd 1954. Cedric Allingham, born 1922 in Bombay, only son of a wealthly British textile manufacturer, was educated privately until he was ten, when his father retired and bought a house near Durban. Allingham's education was continued at schools in South Africa and England until he was seventeen when he entered a sanitorium with a serious illness which kept him on his back for nearly two years. In 1941 he joined the Army (RAOC) and was posted to the Middle East where he spent most of the war. It was during this time that he became interested in Astronomy through "identifying the stars fot want of something better to do in the desert when it was too hot to sleep at night". Since the war, and the tragic death of his parents, whose ship was torpedoed only nine weeks before the German surrender, Allingham has lived a nomadic life in a caravan in which he likes to travel the country, and in which he also makes long trips on the Continent. Most of his time is spent in writing thrillers (which he publishes under a pseudonym) and in bird-watching. He also owns a cottage in Yorkshire where he occasionally retires to do his "serious writng" and observe the moon and planets through his 10 inch reflecting telescope. Since his unique experience, related in this book, he has started to make a collection of Flying Saucer sightings and is planning to carry out further extensive research during 1955 in California where a considerable number of Saucers have been reported seen in recent months. Mr Allingham would seem to have been a very mysterious and enigmatic character, he shared these qualities with Charles Wykeford-Brown, Wykeford-Brown wrote It Came From Uranus, a little known work privately published in 1953.